In a recent law firm retreat, the partners and I discussed tactics to help boost the profile of some excellent lawyers who seem to be overlooked regularly by the various ratings and rankings publications. My first observation was that, like it or not, the ratings and rankings publications have a process to identify and evaluate notable lawyers, and the firm's refusal to play along (or more accurately, its complete ignorance of the process) puts them at a disadvantage as compared to competing firms who invest a lot of time and energy in courting the publications' editors. The fact is, for some firms ratings and rankings publications are good investments, and for other firms there is no greater waste of time. (More of my thoughts here). But whether the goal is increased visibility by publishers or increased visibility by prospective clients, there are some overlapping tactics. When I asked what speaking and writing engagements the lawyers pursued, I was told that it wasn't a focus. It's not a truism of course that all speaking and writing engagements are wise marketing tactics, but for this firm -- at this time, and in its particular niche -- there's a clear opportunity to increase its visibility with the target market. The firm's greatest challenge is inclusion into the consideration set, a fancy marketing term for "the list of firms that are top of mind when a prospective clients thinks about potential firms to help with a specific matter." I did some quick research and learned that there is no other law firm publishing a blog on this firm's specific niche practice, at least not on their coast, so I suggested we think about starting a blog. I shouldn't have been surprised after working with lawyers for all these years, but the blank looks from nearly everyone assembled led me to believe that their familiarity with blogs was on par with their familiarity with the Large Hadron Collider -- sure, they'd heard the name, seen a news article or two, but had no idea the relevance to their firm or practice. With that in mind, I offer this article from the archives. 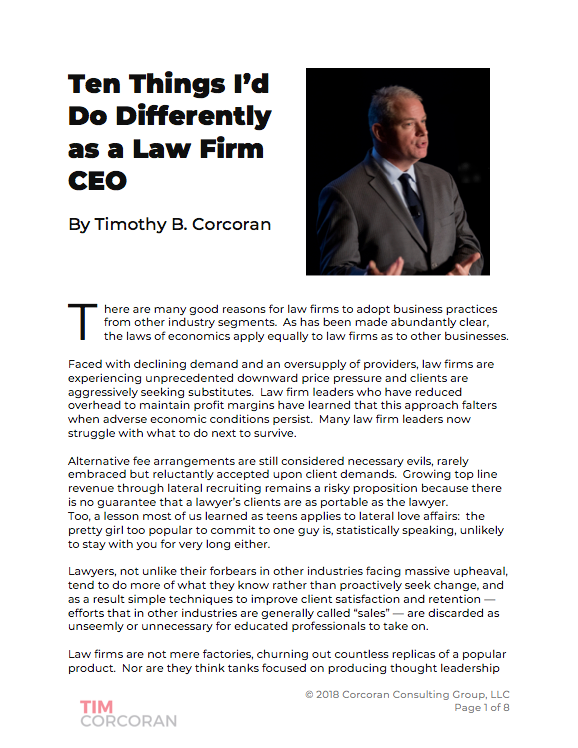 Portions of this article were published in the Marketing the Law Firm newsletter, an American Lawyer publication, and republished in syndication by Law.com and various American Lawyer regional publications, back in 2010 (see a review here). Even then the topic of blogging as a marketing tactic was old news to some law firms, but with the understanding that many lawyers pride themselves more on keeping up with developments in the law rather than developments in marketing tactics, I offer it again. A blog isn't a replacement for in-person networking, delivering fantastic client service or becoming known in your legal community in order to generate referrals. Blogging is a complement to these activities. Enjoy! The primary objectives for networking by lawyers and other business professionals are to increase visibility and demonstrate credibility with clients, potential clients and peers. In a world where the claim of expertise is often indistinguishable, at least on the surface, from actual expertise, it’s critical to clearly exhibit subject matter expertise to the target market. Instead, so many lawyers fall into the trap of describing their attributes and accomplishments as a proxy for demonstrating expertise. A more compelling approach is to find ways to clearly demonstrate that expertise. In this article, we discuss a subject that is at once overplayed and misunderstood: the art and practice of blogging. To those not paying attention in recent years, a blog — short for Weblog — is a commentary published online with no barrier to entry other than a keyboard, an Internet connection and something useful to say. (However, in some cases that last item is in short supply!) A blog is in many ways an improvement to the rules of traditional publishing because anyone can author and publish a blog, the content can be short or long, simple or complex, the topic can be limited to a narrow subject area or cover a wide range of topics, it can be published on any schedule, or no schedule at all, and the format invites commentary and interactive dialog. Imagine having the opportunity to chat at length with the authors of your favorite books, a process that can bring you into the topics on a more visceral level than merely reading can accomplish. As a result of this interactive nature, and this simplicity, and the low barriers to entry, many legal professionals regularly publish blogs on a wide variety of topics. First, let’s discuss the mechanics. Most new technologies can appear daunting at first, so while publishing a blog can appear complex, it’s actually quite simple. To publish a blog, one needs a blog platform, which is roughly analogous to selecting a word-processing application. There are several free platforms, including Blogger, an application offered by Google; WordPress; and Typepad. Each has some unique characteristics but each essentially serves as a writing platform with one-click ability to publish to the Web. Each platform allows customization of the resulting blog Web page, ranging from a very simple text-heavy, one-column, chronologically-ordered presentation to a graphic-rich presentation offering archives, indexes, keyword searches and multiple “widgets.” The latter are optional components offering added functionality, and there’s a wide variety from which to choose to customize one’s presentation. A blog can be “hosted” by one of these providers, or an author can choose to host his or her own blog — though if you’re like most of us and you don’t know what this means or where to go to do your own hosting, then the turnkey operation offered by most blogging platforms may be sufficient. Wherever the blog is hosted, it’s beneficial to secure a custom Web site address and enhanced Web traffic reporting, among other options. Here again the turnkey solutions offered by blog platforms are an easy starting place, and by delegating all of the technical issues the new blog author can focus solely on generating content. So what sort of content is suitable for a blog? Herein lies the beauty of blogging. While a litigator who has developed a niche specialization in products liability for furniture manufacturing may have some difficulty finding a traditional forum for a series of articles on the topic, a blog offers unlimited flexibility. And while there may be multiple bloggers opining on case law changes in the State of California and the Commonwealth of Pennsylvania, each may have as unique a perspective on the topic as do sports commentators when broadcasting a major sporting event. Some blog authors choose to write in-depth, substantive well-researched articles, whereas others offer limited commentary on breaking news, as evidenced by the wide range of blogs addressing recent Supreme Court rulings. Some bloggers generate minimal new creative work, and instead summarize or consolidate headlines on a narrow subject matter. Some blog authors are prolific, publishing several times a week, even several times each day. Others take weeks to offer new commentary. Sadly, many blogs launch with great fanfare and expectations, but fizzle out after a while because the contributing author, or authors, finds it difficult to carve out sufficient time on a regular basis to publish new items. And just as an out-of-date “What’s New” page on a traditional Web site is a terrible message to send (you knew this, didn’t you? ), a blog that hasn’t been updated in months perhaps sends the message that the author has less expertise than promised. But there’s a balance and a pace to be achieved, as with a long distance runner who must be careful not to tire too quickly. By publishing a blog, a lawyer can create and/or change market perceptions. Some lawyers with long experience have a difficult time growing their practice outside their natural geographic or personal networking borders. Others invested time developing a reputation some years prior and do little marketing now, but as client loyalty wanes and market dynamics interrupt longstanding law firm/client relationships, a veteran lawyer with a steady book of business can be suddenly faced with competitive threats from all sides. It can be cost- and time-prohibitive to market one’s practice on a regional, national or even global scale. But one compelling aspect of authoring a blog is the simplicity of generating broad awareness amongst a target market on a wide geographic scale. After all, with the Internet qualified buyers everywhere potentially have access. A lawyer who authors commentary on a regular basis in an area of law in which she or he has useful information to impart can quickly become well-known. The viral nature of the Internet, or in other words, the ability for one to quickly share interesting content with others, can quickly lead to ever-growing concentric circles of readers. Naturally, a blog author with hundreds, even thousands, of regular readers will be afforded more respect as an expert than one who toils silently in the corner office, relying on referrals and word of mouth alone to generate new business. A very common concern many lawyers express when discussing blogs is how frequently supposed non-experts hold themselves out to be experts. Set aside for a moment the use of “expert” as a term of art indicating the achievement of certain qualifications that are recognized by the Bar. In the vernacular, an expert is one deemed to be capable of providing informed counsel on topics relevant to the buyer. More than a few television weather broadcasters are not trained meteorologists; more than a few talk show therapists have no training in medicine or psychology or psychiatry. So it should come as no surprise that a lawyer with five years’ experience in a practice may be seen as a peer to a lawyer with 25 years’ experience, based primarily on perceptions shaped by visibility, visibility influenced by a well-read blog. Now, of course the goal isn’t to use a blog as a platform to hold oneself out as something one is not. But the simplicity of incorporating a blog into one’s business development toolkit allows lawyers who are in the early stages of a learning curve to have equal opportunity as those who have long mastered the subject. In the end, those with clear, concise, authoritative and easy-to-read prose will outshine those who have little to say. In this way, the world of blog publishing is self-regulating. Some firms outsource blog content to expert writers from outside the firm or from within, and the lawyer reviews the work before publication. While this can be an efficient way to generate regular content — which is by far the most challenging aspect of maintaining a blog — one critical element that is lost in such an approach is “voice.” The most popular bloggers insert their own personalities into their writing, and it’s as much the style as the content which attracts and retains readers. When a blog becomes a sterile conduit for corporate speak or legalease, then it may impart information but fail to attract a loyal following. In addition to content, one can outsource the entire blog setup and technology. As an independent consultant, I don't promote individual products or services but it may be helpful to look at some of the more notable providers in the space, many of whom are led by friends of mine (here and here and here and here and here and here and here and here and here -- this last one provides generous strategic and technology support for the blog you're reading!). There are many marketing and business development tactics competing for busy lawyers’ time. There is a constant struggle to network to one’s target market. Blogs have proven to be an effective tactic to establish subject matter expertise, and the Internet search engines which are designed to promote sites with frequently updated content can help reach a target audience on a scale that other networking tactics, and traditional publishing venues, may not. But publishing a blog requires discipline, a regular influx of new ideas, and desire. With these, plus a simple and easy-to-use blog publishing platform, any lawyer can achieve credibility and visibility with ease.